This book provides insight into familiar Scripture passages-poetic passages that were later often set to music. By showing that some composers of traditional New Testament hymns within the prose, it presents the hidden depth behind their construction and meaning. A Symphony of New Testament Hymns opens a window of insight into familiar Scripture passages - poetic passages that were later often set to music. By showing that the composers of some of these traditional New Testament, pre-60 C.E. hymns intentionally created passages that are lyrical or hymnic within the prose, this work presents the sometimes hidden depth behind their construction and meaning. Inspired by Roy Harris' Folksong Symphony, Father Karris arranges his treatment of Philippians 2:6-11, Colossians 1:15-20, Ephesians 2:14-16, Timothy 3:16, 2 Timothy 2:11-13, Titus 3:4-7, and 1 Peter 3:18-22 in a way that faith-fully addresses today's spiritual concerns, such as spirituality, ecology, reconciliation, baptism, and angels. 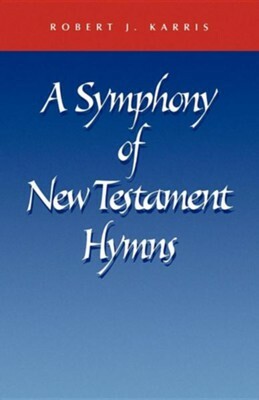 The first book in English in thirty years to study New Testament hymns, A Symphony of New Testament Hymns brings readers greater enjoyment of these lesser-known Pauline hymns and a deepening of faith. Father Karris contends we have much to learn from what these songs proclaimed about Jesus at a time when the four gospels hadn't been published. The first chapters, Beginnings" and "Background," address the nature of hymns. Subsequent chapters contain a translation and analysis of the above texts, a study of contexts, key concepts and images, suggestions for reflection on the contemporary significance of the hymn, and an annotated bibliography. The concluding chapter offers a retrospective look at the many Christological themes reflected in the texts. ViewingPaul's letters and the common New Testament introduction topics from a refreshingly unique perspective, A Symphony of New Testament Hymns is especially appropriate for students and professors of the New Testament. Those looking for biblical spirituality, liturgists and musicians looking for new texts to set, and those in catechetical work - especially those involved in the RCIA - will also benefit from Father Karris' distinctive look at how the earliest Christians lyrically proclaimed Jesus Christ as Lord. Robert J. Karris, OFM, taught New Testament for sixteen years at Catholic Theological Union in Chicago. He is a veteran author, known primarily for his studies on Luke. He holds a ThD from Harvard University. Robert J. Karris, OFM, ThD, is head of research at the Franciscan Institute at St. Bonaventure University in St. Bonaventure, New York. He has published more than fifteen books, including Liturgical Press titles Jesus and the Marginalized in John's Gospel, Symphony of New Testament Hymns, and Commentary on Galatians and Romans. I'm the author/artist and I want to review A Symphony of New Testament Hymns.